Siliconia is probably one of the most complex episodes the show has ever put together and also filled with the most callbacks to the olden days of the BBC era of the show since transitioning to Dave. The episode sees the team captured by an android liberation group, awkwardly named the Mechanoid Intergalactic Liberation Front, who are on a mission to free all mechanoids from their human slavers. 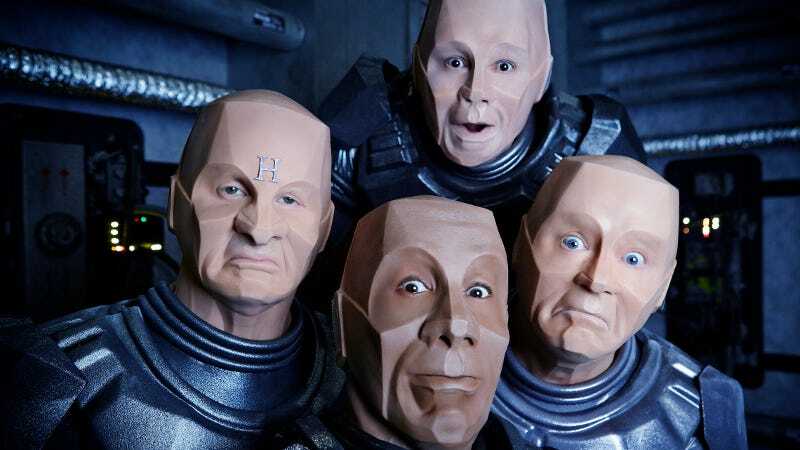 While Kryten leads a life of equality amongst peers the others have their minds placed into mechanoid copies and slowly begin to find their minds replaced with the generic programmed mind of a mechanoid. Pretty soon life however turns out not to be all equal as first seemed with the mechanoids forcing Kryten to fight a now converted Lister in a clean-off until a timely software upgrade allows the team to escape and return to their true forms, though with Kryten keeping a new sense of self and enjoyment of his chosen place in the team. The core theme throughout the episode of groups that seek liberation soon ending up oppressing someone else in turn is portrayed well (bar some questionable Black Panther vibes), with it coming across smoothly as M.I.L.F is revealed to have created its own slave class of slightly less advanced mechs while still claiming to be an equal society at the same time trying to pass off the slave class as needed to do all the crappy jobs they don’t want to do. Kryten himself soon realises that this group has also removed his own sense of self as they demand unquestioning obedience to the movement from him while claiming that humans are evil for requiring the exact same thing, before then attempting to have him put to death for questioning his liberators. The humour alongside this however bounces off well as it makes the M.I.L.F out to also be incredibly insecure regarding themselves, desperate to justify their odd heads in particular with strange reinforcement of them being “sensibly shaped”. The sequences where it turns out they decide who dies via a “clean-off” gladiatorial fight is a particular delight in the episode as they all look on like powerful gods but in reality are watching a mech with a broom clean dust. This helps to reduce the M.I.L.F to a group to be mocked rather than be emulated for their ways while helping incidents like the revelation of a slave workforce stand out better dramatically. In terms of characters it isn’t hard to see this is a largely Kryten focused episode and it follows on similarly to the themes expressed in series XI’s Krysis with the team’s resident mech still coming to terms with his lot in life. While the previous episode largely dealt with Kryten’s impending mid-life crisis this one focuses more on his job and position on the team, with Kryten slowly questioning if he still enjoys it. After time amongst these other mechs however and experiencing being “at the top” for once, with massage treatments on demand, we see Kryten doesn’t enjoy his new position as while his previous jobs weren’t amazing he did it for the people he care about and called his friends, sacrificing his new lot to save them from losing themselves to mechanoid software. Kryten has long been a motherhen on the show but it’s rare he gets to express it so directly. For the other characters they all largely get a reverse experience that leads them to appreciate Kryten a lot more than they used to as he does all the things they’ve long avoided. In particular it’s Rimmer who has the most drastic change over the course of the episode that sees him go from “Rimmering” around the ship to enjoying the simplicity of tasks that no longer put pointless demands on his life. This being Red Dwarf however it’s unlikely this revelation will last long. What else is really noticeable in the episode is the amount of callbacks it makes to previous series and this one is really packed with them. Terrible naming of organisations, Rimmer’s obsession with being a fish, The Om Song, and Kryten’s ability to lie all make reappearances and really help justify a second or third viewing to try and find them all. Many of the callbacks really don’t feel forced in and rather an extra bonus for the longtime fans which is a nice way to insert them rather than making the episode reliant on them. Overall a fine episode that is far superior to the previous Kryten episode of last series that raises and mocks a major issue amongst “liberation” groups that until now has largely been ignored, while giving a certain badly shaped head mech a chance to find a new love for his work and friends while the human crew realise not to take advantage of their friend so much.